Aims and Objectives: The aim of this study was to evaluate the effect of the precipitate formed by using sodium hypochlorite and chlorhexidine as a root canal irrigant on the sealing ability of different root canal sealers, using a push-out bond strength test. Materials and Methods: Twenty single rooted premolars were used for this study. The teeth were divided into two groups (Groups I and II) of ten teeth each, according to the obturation done with AH Plus with GuttaPercha and Resilon with epiphany, respectively. The groups were in turn divided into two subgroups of five teeth each (Subgroups A and B) according to the irrigation protocol, and were evaluated using a micro push-out bond strength, with the help of a universal testing machine. Statistical analysis was done using the paired t test. Results: The mean value of the AH Plus GuttaPercha group with precipitate formation (17.66 ± 0.56) showed the highest mean value for the bond strength, which was statistically higher (P < 0.05) than the rest of the groups. In the Resilon Epiphany group, the samples with precipitate formation showed (13.28 ± 1.35) the least bond strength, which was statistically lower than all the groups, except the Resilon samples without precipitate (13.99 ± 0.48). Conclusion: The precipitate formed by a combination of sodium hypochlorite and chlorhexidine tends to affect the bond strength of the sealers used for obturation. The most commonly used irrigating solutions are sodium hypochlorite, chlorhexidine, Ethylenediaminetetraacetic acid (EDTA), mixture of tetracycline, acetic acid and detergent Tween-80 (MTAD) and so on. Sodium hypochlorite has effective antibacterial action, organic material dissolution,  and also removes the necrotic tissue. However, there is a safety concern if sodium hypochlorite is extruded out of the root canal into the periapical tissue, resulting in destructive tissue damage. Thus, an alternative irrigant, such as, chlorhexidine, has been advocated. It is interesting to know that the usage of chlorhexidine as a final rinse in the root canal system, in the presence of residual sodium hypochlorite, leads to the formation of an orange-brown color precipitate. This precipitate tends to occlude the dentinal tubules. The interaction of this precipitate with the sealers used in obturation has not been evaluated to date. The aim of this study is to evaluate the effect of the precipitate formed by using sodium hypochlorite and chlorhexidine as the root canal irrigant on the sealing ability of different root canal sealers, using the push-out bond strength test. The hypothesis put forward was that the presence of a precipitate might affect the bond strength of the resin sealers to dentin. Twenty sound, single-rooted, extracted mandibular premolars were taken for this study. The teeth were extracted for orthodontic reasons and stored in saline until use. The teeth were then marked at a level of 16 mm from the root apex using a measuring ruler and were then decoronated with a diamond disk. The working length was established. All the samples were instrumented with 0.06 profile nickel titanium instruments, using the crown-down technique. Each canal instrumentation was carried out up to the master apical file (MAF) No. 30. This was performed in accordance with the study done by Abbasali et al., (2006), who stated that the minimum instrumentation size needed for penetration of irrigants to the apical third of a root canal was a 30 size file with a 0.06 coronal taper. During instrumentation, irrigation was carried out using 5.25% Sodium Hypochlorite. After the completion of instrumentation, for smear layer removal, the canals were rinsed thoroughly with 5 ml of 17% EDTA, for one minute. Next, the samples were divided into two groups and the protocol followed was as shown in [Figure 1]. From the statistical analysis it was found that the mean value of the AH Plus GuttaPercha group, without precipitate formation (29.31 ± 0.91), showed the highest mean value for the bond strength, which was statistically higher (P < 0.05) than the rest of the groups [Table 1]. In the Resilon Epiphany group the samples with precipitate formation showed (13.28 ± 1.35) the least bond strength, which was statistically lower than all the groups, except the Resilon samples without precipitate (13.99 ± 0.48) [Table 1]. Different irrigating solutions are used alone or in combination with one another, to aid in better cleaning and shaping, and reduction of the bacterial load in root canals. For the success of endodontic treatment it is essential that cleaning and shaping must be followed by complete obturation, with an impervious, biocompatible, and dimensionally stable material. GuttaPercha is a root canal filling material and has served as a benchmark for evaluating newer materials when used with different sealers. A wide variety of sealers are used along with GuttaPercha. Sealers can be grouped based on their prime constituent or structure, such as, zinc oxide eugenol, calcium hydroxide, glass ionomer, and resin sealer. A resin sealer like AH Plus is a slow setting epoxy resin that was developed from AH 26 to overcome the problem of formaldehyde release during setting. The advantages of the epoxy resin are its flow properties and better bond strength,  but many previous studies showing leakage , have been reported. In the present study emphasis is given to the orange-brown, discolored precipitate formed by the interaction of sodium hypochlorite and chlorhexidine. The orange-brown color of the precipitate occurs when chlorhexidine gets hydrolyzed into smaller fragments, due to breakage of the bond between carbon and nitrogen, forming a byproduct Para ChloroAnaline (PCA). In light of the push-out bond test, the hypothesis that the presence of the precipitate might affect the bond strength of the resin-based sealer to the dentin is partially rejected. The AH Plus Control group showed the highest bond strength (29.30 ± 0.19), which was significantly higher than the rest of the groups. The Resilon epiphany group with the precipitate formation showed the least strength (13.28 ± 1.35), which was statistically lower than the AH Plus Groups, but this was not the case for the Resilon group in which no precipitate was formed (13.99 ± 0.48). This could possibly explain why the strength of the AH Plus resin, even in the presence of a precipitate, was significantly higher than the Resilon groups. The primary mode of adhesion of different sealers to root dentin is by forming tags that penetrate better into the root dentinal tubules, which open after the smear layer removal by EDTA. In case sodium hypochlorite is used, these open tubules harbor enough residual sodium hypochlorite, which can react with the chlorhexidine used finally, and leads to the formation of a precipitate, which appears to coat the root canal surface and obliterate the dentinal tubules. This could possibly be the reason for the decrease in bond strength. The bond strength of Group III (Resilon with precipitate) was higher than that of Group IV (Resilon without Precipitate), which was not statistically significant. This could be attributed to a previous study by Julian et al.,  which stated that chlorhexidine did not adversely effect the adhesion of self-etch adhesive systems. The presence of these precipitates and discoloration with harmful properties has raised a question on their usage. In order to find a solution to these problems studies are being conducted to dissolve the precipitate formed by sodium hypochlorite and chlorhexidine using methanol and pure acetic acid. The precipitate was successfully dissolved in 0.1 M/L of the acetic acid, but the discoloration persisted. Thus, further exploration is required to establish an irrigation protocol for the newer irrgating materials to be used in combination with other materials, keeping in mind their interactions with one another, avoiding the occurrence of products that could provide harmful effects on the properties of other materials. The precipitate formed by the combination of sodium hypochlorite and chlorhexidine tends to decrease the bond strength of the sealers used for obturation. The highest bond strength is noted in the AH Plus group without precipitate. There is a marked decrease in the bond strength of AH Plus in the presence of this precipitate, which is statistically significant. Resilon groups are statistically different from the AH Plus Group, but there is no statistical difference between the Resilon groups with and without precipitate. 1. Santos JN, Carrilho MR, De Goes MF, Zaia AA, Gomes BP, Souza-Filho FJ, et al. Effect of chemical irrigants on the bond strength of a self etching adhesive to pulp chamber dentin. J Endod 2006;32:1088-90. 2. Schwartz RS. Adhesive dentistry and Endodontics. Part 2: Bonding in the root canal system-the promise and the problems: A review. J Endod 2006;32:1125-34. 3. Ayhan H, Sultan N, Cirak M, Ruhi MZ, Bodur H. Antimicrobial effects of various endodontic irrigants on selected microorganisms. Int Endod J 1999;32:99-102. 4. Hulsmann M, Hahn W. Complications during root canal irrigation-literature review and case reports. Int Endod J 2000;33:186-93. 5. Leonardo MR, Tanomaru Filho M, Silva LA, Nelson Filho P, Bonifácio KC, Ito IY. 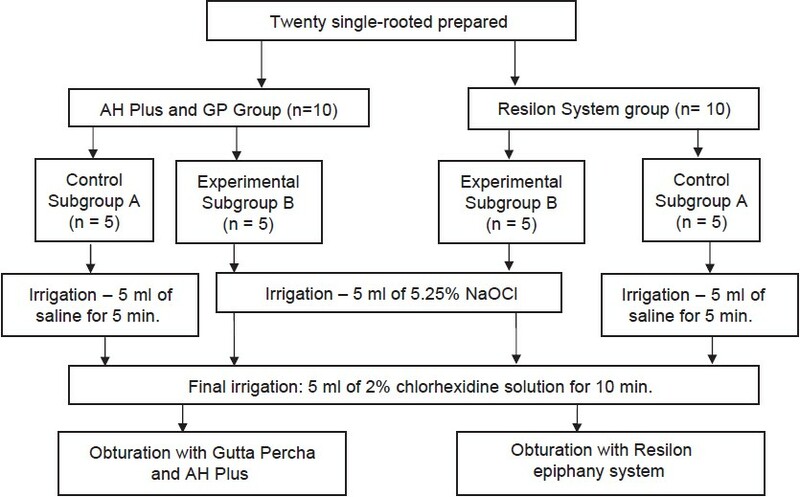 In vivo antimicrobial activity of 2% chlorhexidine used as a root canal irrigating solution. J Endod 1999;25:167-71. 6. Zamany A, Safavi K, Spangberg LSW. The effect of chlorhexidine as an Endodontic disinfectant. Oral Surg Oral Med Oral Pathol Oral Radiol Endod 2003;96:578-81. 7. Oliveira DP, Barbizam JV, Trope M, Teixeira FB. In vitro antibacterial efficacy of endodontic irrigant against Enterococcus faecalis. Oral Surg oral Med Oral Pathol Oral Radiol Endod 2007;103:702-6. 8. Estrela C, Ribeiro RG, Estrela CR, Pécora JD, Sousa-Neto MD. Antimicrobial effect of 2% Sodium Hypochlorite and 2% chlorhexidine tested by different methods. Braz Dent J 2003;13:58-62. 9. Zehnder M. Root canal irrigants. J Endod 2006;32:389-98. 10. Yamada RS, Armas A, Goldman M, Lin PS. A scanning electron microscopic comparison of a high volume final flush with several irrigating solutions: Part 3. J Endod 1983;9:137-42. 11. Shipper G, Teixeira FB, Arnold RR, Trope M. Periapical inflammation after coronal microbial inoculation of dog roots filled with guttapercha or Resilon. J Endod 2005;31:91-6. 12. Skidmore LJ, Berzins DW, Bahcall JK. An in vitro comparison of the intraradicular dentin bond strength of Resilon and guttapercha. J Endod 2006;32:963-6. 13. Basrani BR, Manek S, Sodi RNS, Fillery E, Manzur A. Interaction between sodium hypochlorite and chlorhexidinegluconate. J Endod 2007;33:966-9. 14. Bui TB, Baumgartner C, Mitchell JC. Evaluation of the interaction between sodium hypochlorite and chlorhexidinegluconate and its effect on root dentin. J Endod 2008;34:181-5. 15. Khadami A, Yazdizadeb M, Feizianfard M. Determination of the minimum instrumentation size for penetration of irrigants to the apical third of root canal systems. J Endod 2006;32:417-20. 16. Patel DV, Sherriff M, Ford TRP, Watson TF, Mannocci F. The penetration of RealSeal primer and Tubliseal into root canal dentinal tubules: A confocal microscopic study. Int Endod J 2007;40:67-71. 17. Torabinejad M, Ung B, Kettering JD. In vitro bacterial penetration of coronally unsealed endodontically treated teeth. J Endod 1990;16:566-9. 18. Tagger M, Tagger E, Tjan EHL, Bakland LK. Measurement of adhesion of endodontic sealers to dentin. J Endod 2002;28:351-4. 19. Barnett F, Trope M. Resilon™: A novel material to replace guttapercha. Contemp Endod 2004;1:16-9. 20. Fisher MA, Berzins DW, Bahcall JK. An in vitro comparison of bond strength of various Obturation materials to root canal dentin using push out test design. J Endod 2007;33:856-8. 21. Gesi A, Rafaelli O, Goracci C, Pashley DH, Tay FR, Ferrari M. Interfacial strength of Resilon and guttapercha to intraradicular dentin. J Endod 2005;31:809-13. 22. Tay FR, Mazzoni A, Pashley DH, Day TE, Ngob EC, Breschi L. Potential iatrogenic tetracycline staining of endodontically treated teeth via NaOCl/MTAD irrigation: A preliminary report. J Endod 2006;32:354-8. 23. Mcketta JJ, Cunningham WA. Encyclopedia of chemical processing and design. vol 19. CRC Press; 1983. p. 263. 24. Eldeniz AU, Erdemir A, Beli S. Shear bond strength of three resin based sealers to dentin with and without the smear layer. J Endod 2005;31:293-6. 25. Torabinjad M, Cho Y, Khademi AA, Bakland LK, Shabahang S. The effect of various concentrations of sodium hypochlorite on the ability of MTAD to remove the smear layer. J Endod 2003;29:233-9.